Inside: Learn how to organize your sub tub, so you don’t need to stress about sub plans last minute ever again! It’s no secret that having a sub in your room can be more work than just trudging through the day sick. This shouldn’t be the case, but many teachers don’t use their sick days for this very reason. By organizing your sub materials way before you need a guest teacher in your classroom, you’ll be more at ease and have a lot less work when you return. Check out how to organize your perfect sub tub with these easy tips. Disclaimer: This post contains affiliate links. See disclosure. A container for your sub tub. (I often get asked where I got the cute one used in these pictures. If you’re wondering, this is the one I used). Keep a binder of master copies. Keep student copies organized in folders in a sub tub. 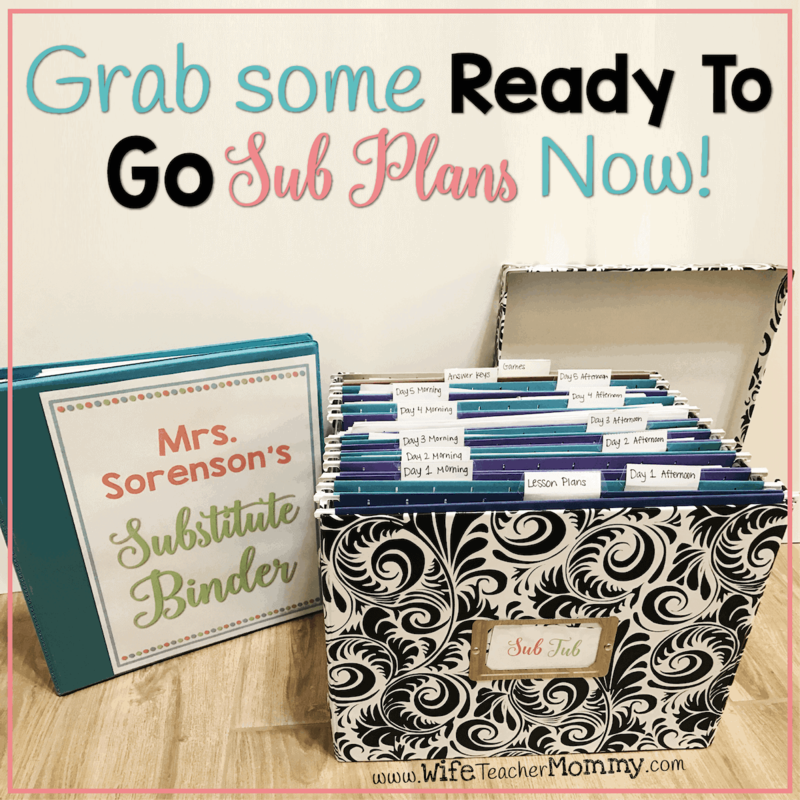 Get a container to put all of your sub plans in. (I used this cute one from Amazon). This will be your sub tub. Organize student copies by day of the week, time of day, or content area depending on your grade level and schedule. Put the lesson plans in the hanging file folders inside the sub tub. Let your sub know the schedule in your plans, and then all they will need to do is pull out the papers needed from the designated folders. Easy! Add a folder for your sub at the front of the tub to include lesson plans. Additional folders may also be included. I love adding one for brain breaks or games. These can be used during transition times or for early finishers in the classroom. I also like to create a “morning” folder and an “afternoon” folder. The sub can easily pull out what they need in the morning and again after lunch. And if you’re only gone for a half day, they’ll just pull out the one they need! Label where your sub tub is located clearly. It does no good to have an organized sub tub if your substitute has no idea where to find it! 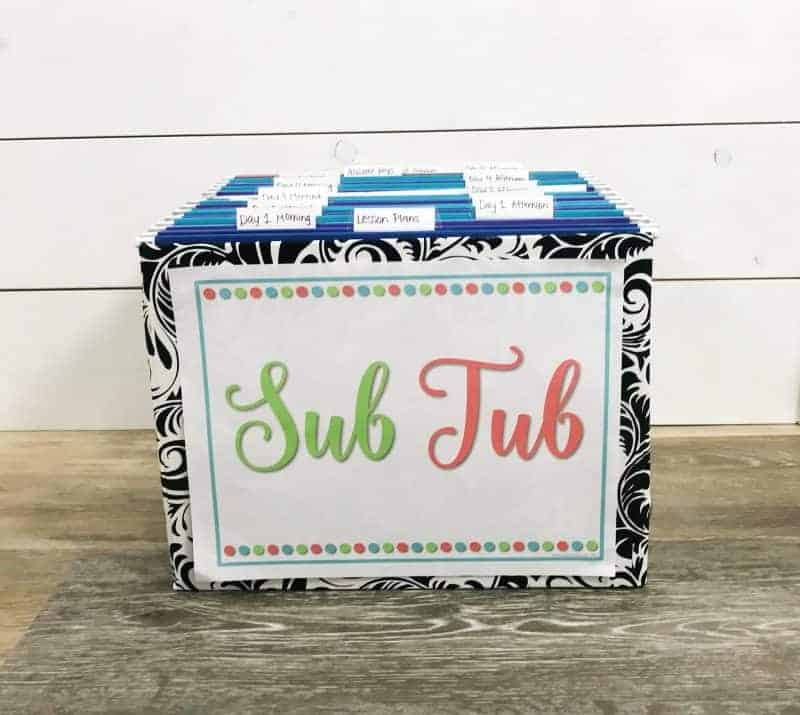 Let your sub know where to find the organize your perfect sub tub by grabbing a FREE sub tub label in our resource library (pictured above). If you haven’t signed up for the resource library yet, you can sign up here. It’s free! If you’ve previously signed up, click here to go to the free resource library (and enter the password from the most recent email). If you keep your sub tub in a cabinet, consider placing the label on the outside of the cabinet so it is easy to see. Having your materials placed in an organized fashion will help your sub and your students be prepared when you are gone from your classroom. You can also let some of your co-teachers know where your sub tub is located, just in case your sub can’t find it! Leave notes for your substitute to let you know how to use your sub tub and the general flow of your day. You can also leave a note for the sub to fill out the end of the day. This serves as a reminder to your sub to leave notes for you, and helps you to know how the day went. It’s also a great idea to keep thank you notes on hand, because we appreciate substitutes who give us the break that we need! Want to get your sub tub organized in the EASIEST way possible? Putting together a complete sub tub from scratch can take a lot of time! Are you a work-smarter-not-harder kind of teacher? I’ve made Ready To Go Sub Plans JUST for you! Teachers have loved that these sub plans are literally print-and-go. Each set of Ready To Go Sub Plans includes an ELA lesson, reading lesson, writing lesson, science lesson, math review, math lesson, social studies lesson, brain break, art activity, and an educational game! The lesson plans are simple to follow, with engaging learning activities for the kids. Each set is guaranteed to last at least a full day. (You can also find these on TPT)! What have teachers had to say about Ready To Go Sub Plans? As you can see, these sub plans have been a lifesaver to many teachers! I hope they can be a great resource for you as well. When you purchase these ahead of time, you can be well on your way to having a full sub tub prepared for the next time you need to take a last minute absence. Teachers work so hard, so you deserve to take a day off when needed without all of the stress. You can also find my sub plans in my Teachers pay Teachers store! Being absent can be stressful for you, your students, and a substitute teacher if you aren’t organized and prepared. Being able to organize your perfect sub tub will help everything run smoothly whether you’re out for a morning or a week! I have my sub tub almost finalized! I am no longer worried if I have an emergency and need to miss school!! That’s so good! Glad you’ve almost finished! This is great!!!! I never take time off! When my boys are sick, I just leave them home alone because they are old enough now…they’re in middle school, and I always feel guilty! Creating an amazing sub tub like this will give me peace of mind for when my boys (or myself) are sick! Thanks! No problem, Rachel! It is super helpful, especially as a mom because then you can just take the time off when those times come up. The sub tub sounds super accessbile and easy to use. This is great! It’s nice to know that my sub will be organized and know where everything is while using this! As a 2nd year teacher still trying to figure it all out, I love how thorough these sub plans are and all the tips you give to organize them! So helpful! Honestly I have always been excited to put together a sub tub, because I love crafty projects – however, the curriculum and worksheets for the tub was a completely different story. What can I leave that will actually get done? Your plans are not only wonderful to leave behind, but are amazing to learn from for a growing teacher! Thank you! Thank you so much! <3 Glad they are so helpful for you! Ah yes. Organization is key! I purchased this resource and absolutely LOVE IT!! It took time to get it ready but I don’t worry what will happen if I’m ever sick! My teammates can just pull it and the sub is fully prepared! As a SPED teacher working with several different students at different levels, this is a wonderful way to get ready for emergencies, or just for those days when I need a professional day for testing or meetings. Thanks for the freebie and the ideas! I used the freebie to create a sub binder. The sub tub is next on the list. Good thought about the master copies! I would NOT remember to do that. It’s such a HUGE timesaver the next time around! I can’t wait to get started on my sub tub! I don’t take very many sick days because it is too much of a hassle, this will change once I have it out together. There won’t be as much stress. These sub binders and supplements are the easiest way to set up emergency sub plans for those days that you’re sick in bed. Everything is ready to go! This product is drool-worthy. Especially for a teacher who struggles to stay on top of her game. Love this. These tips are so helpful. The motivates me to make my own! Love the organizational ideas! This helped me in sub prep! These are really helpful tips for planning for a sub! Thanks for trying to take the stress out of this! As a current substitute teacher and someone who just graduated and about to start as a beginning teacher, I can say this resource is so helpful!!! Can’t wait to check out more!!! When I get sick, it’s normally very unannounced. So I need emergency plans to give to my teammates. Usually I have to rely on Chrome book work or work my team gets ready for me and it stresses me out. This will change everything!!!!! Thanks, Lindsey! It can be very helpful to plan ahead so you don’t have to stress when the time comes! I love my Sub Binder! I have added information about specific medical needs in my room and details about the associates that help in my room and what they do throughout the day. Thanks so much for this great resource! So glad you love it! Thank you, Vicki! Love the idea of thank you cards ready to go!!! I always leave a thank you, but a card is so much more heartfelt! Glad you liked that idea! 🙂 Thanks, Laura! This seems like a total time saver, which means a total life saver! What a great post and one that all teachers will be thankful for!! I appreciate how thorough you have made this! Thank you, Marie! Glad you enjoyed it. Thanks, Jes! Glad you found the post helpful! I love these tips. I need to get a bigger tub for my sub plans. I also like the idea of keeping a master copy. Thanks for the tips! You’re welcome, Vandana! Thanks for reading! It is such a relief to have an emergency sub tub prepped and organized for any unexpected events. Changing grade levels is always a challenge! But this resource removes the “what do I leave a sub” dilemma! Thank you! This is awesome! I can’t wait to put mine together! Great ideas for being prepared. These are great tips! They will save me so much time! So glad they will help! I need to get this organized for my classroom. Then I went feel as stressed out when I need to take a last minute sick day. You are a life saver! 🙏 This is an amazing post and very helpful. This is really great! I’ve used binders and folders before for a sub but never a tub like this I’ll have to look into getting one because I love the simplicity of it! Thanks so much! They can really be helpful 🙂 Reach out if you have any questions! Keeping master copies is such a smart idea that I totally have not been keeping up with. I always think I’ll just print it out yet, but perhaps along with new organizational methods come new routines. Yes! The master copy is so helpful. Thanks for reading, Emma! I love the master copies plan! As a sub I hated digging through host teachers items. Yes! It makes even more sense once you’ve been on both sides (teacher and sub). The sub tub looks amazing! It is definitely something all teachers should have! Very useful information and a time saver!! I love the container too! It also gets so many compliments. I love the idea of having a master copy binder. Therefore, not only if the sub needs more copies but I can just reprint and have for next year! Yes! The master copy is a huge time saver. Thanks for reading, Katie! I am changing grade levels next school year, these tips will be so handy to get things organized and ready for a sub. Thank you for taking time to create and share your sub plans tub with the rest of the teaching world! I just came across this website….and I am already obsessed! I have been subbing and am about to graduate and start teaching. I am putting all of these resources in my folder so I can be as organized as possible! These are absolutely amazing and I can’t wait to see what else I find here. And don’t hesitate to let me know if I can help with anything.